My friend Jake recently bought a portable blender for tailgating and family camping trips. It was a cool little (expensive!) appliance rechargeable by USB cable. Excited, he fully recharged it at home in preparation for the upcoming trip. Then carried the heavy thing in his backpack all day. The charge was gone after 3 minutes and the blades hardly shredded anything by then! To save you from making the mistake Jake did, and to help you find the best one for your needs, I’ve researched and put together this guide. So, let's start with a quick table to compare the best models available today. While going mobile does mean that you have to sacrifice some speed and performance, it doesn’t mean that you are limited in your drink options. As you will see, these portable blenders allow you to enjoy yourself without having to be next to a kitchen outlet. Power Source - Rechargeable or Not? How long will it hold charge? This popular portable blender is ideal for tailgating. As far as kitchen appliance brands go, Waring is one of the better companies out there. 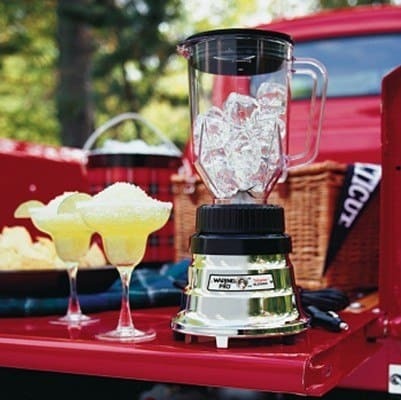 While they usually specialize in cooking materials, their TG15 is a more than sufficient portable blender that is sure to be indispensable for your next tailgate or camping trip. Because this blender is designed for on-the-go mixing, it doesn’t draw very much power, meaning that you should be able to use it time and time again without making your car or boat die. At only eighty watts, the motor is both powerful enough to crush ice cubes yet efficient enough not to blow any fuses. Given the relatively weak motor, the Tailgater does a surprisingly good job handling ice. Although ice doesn’t become the perfect snow you’d see with higher end blenders, it does give ice nice slushy-like texture. As for size, this blender makes 48 ounces of your favorite beverages, which is enough for about 5-6 drinks, so you can serve everyone in less time. That, coupled with a single-button operation makes this one of the easiest blenders to have. Finally, the best part about this unit is that it comes with an extra long power cord so that you can plug into your car and still have room to set up your tailgate party. Who’s it NOT For: Anyone who wants a blender for their kitchen. This is designed for portability, not power. Best choice for this category, in our opinion. If you’ve ever been to Jimmy Buffet’s Margaritaville, then you know that the drinks there are top-notch. Part of the reason they are so delicious is because of the way that they’re prepared. Frozen margaritas are so much better when the ice is shaved into fine pieces that melt in your mouth. Now, you can have that same experience in the comfort of your own home or even outdoors. This is the ideal machine for party drinks - pina coladas, daiquiris, margaritas as well as healthy smoothies. We especially like the pre-programmed setting for shaved ice​ and combined shave 'n blend! Although we are highlighting portable blenders, this is technically a standard model that needs a regular outlet to work. However, because it doesn’t draw too much power, you should be able to plug it into your car or boat with an adapter and not have any issues. What makes this blender so excellent is that it is designed for drinks. The large 36-ounce pitcher makes enough for three or four people, meaning you can have everyone feeling good in no time. The pitcher also has markings, so you get your measurements just right. Finally, the powerful motor will shave or blend your drinks, depending on your needs. Shaved ice is perfect for frozen margaritas and daiquiris, whereas blending is better for mixed drinks or smoothies. Overall, you can be the life of the party with this blender. Who’s it NOT for: People who want to use it as a primary home blender for smoothies - a better home alternative would be the NutriBullet Rx, though it requires a regular power outlet or a power generator. As we mentioned, portable blenders can be standalone units like the ones we’ve seen thus far, or they can be handheld battery operated stick blenders such as the Cuisinart CSB-300. If you are more interested in making powdered beverages, hot drinks or some smoothies, then handheld is the way to go. In this instance, you can crush ice as well, but it won’t be as even as if you had a stand-up model. But what really sold us on this hand blender is its rechargeable battery, which means you can use it for a good 20 minutes even when there's no power source around! When you do get near a power source, re-charging is also quick which is a big plus. Its relatively compact dimensions mean it is an ideal travel blender, provided you're not into blending tough vegetables on a regular basis. As far as performance goes, the CSB-300 is one of the best hand (immersion) blenders around. It comes with five speed settings, a comfortably long 9-inch shaft, and a robust 3-inch stainless steel blade. Best of all, it’s battery powered so that you don’t have to worry about getting a power cord in the way. On a full charge, this blender will last up to twenty minutes. What makes this unit so valuable is the wealth of accessories that are included. 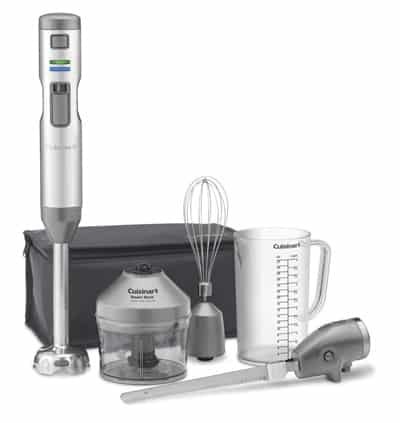 In addition to the standard blender, you get an electric carving knife, a three-cup food processor (for nuts and cheeses), a whisk for mixing, a measuring cup to ensure proper amounts, and even a carrying case to hold everything. This is the ultimate kitchen tool when you’re on the go. Excellent for mixing, not for smoothie pros. Black + Decker’s Gizmo HandyMixer is quite similar to the CSB-300 above, but it doesn’t have the versatility or power as that model. The first thing that you will notice about the Gizmo is that it can fold in half. It enables you to always find the right angle for mixing so that you aren’t stuck at an awkward angle as you work. Additionally, you get three different attachment heads so that you can use it as you see fit. The first attachment is a standard blender, then a whisk for mixing, and finally a frother to make whipped cream or fluffy eggs. Each attachment is easy to install and even simpler to clean. Overall, this is a highly capable handheld blending and mixing system. Great for mixing powdered shakes with soft ingredients. So far, we’ve seen blenders that were meant for making big batches of frozen drinks. But what if you want to make something just for yourself? That’s where the PROMiXX comes in. 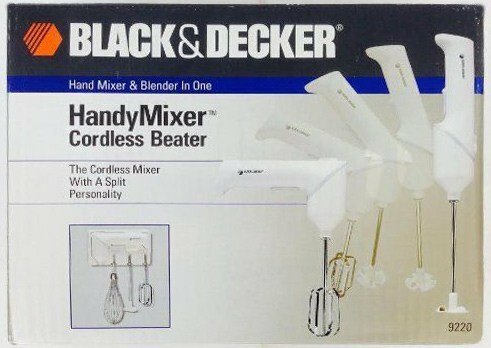 What sets this apart from the rest is that it is a single-serving portable mixer. You can take this device wherever you go and make drinks real quick. One thing to keep in mind about the PROMiXX, however, is that it is not built for frozen drinks. So, placing ice inside will result in a thick, chunky mess so don’t even try it. Instead, this blender is designed for powdered drinks or adding ingredients to your hot coffee in the morning. The way it works is that you press the button on the bottom and it creates a powerful vortex which will mix any powder or liquids instantly. Spinning at 12,000 rpm means that it works fast and won’t leave anything behind. Best of all, it runs on two standard AAA batteries - just take it anywhere you want without having to plug it in for any reason. 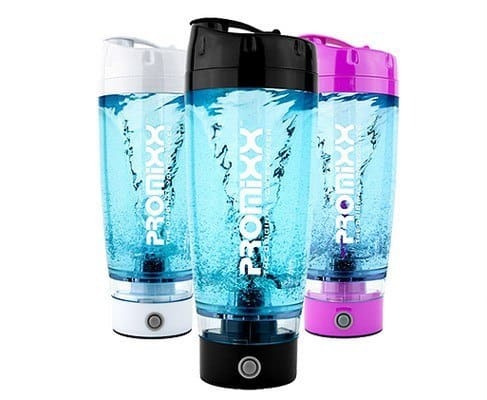 If you’re consuming a more stubborn powder, the PROMiXX does have an upgrade kit which turns it into a USB rechargeable blender featuring a high-power rechargeable battery. It also includes integrated storage. So far, we’ve only looked at blenders that required some form of electricity to work. Even though they aren’t married to an outlet, you still have to rely on batteries, whether they are made from lithium-ion or come from your car or boat. However, what do you do if you want to make high-quality blended drinks without having to draw energy from somewhere? Wouldn’t it be terrific if you could operate a blender by hand, rather than electricity? UPDATE: we’ve discovered this product has been discontinued. We’ll update the link as soon as it’s back. The best alternative is currently the Waring TG15 Tailgater. If you want to rough it outdoors, it usually means that you can’t have modern luxuries like frozen drinks or healthy smoothies. Fortunately for you, the GSI Outdoor Vortex Blender is hand operated, which makes it the perfect camping blender. Now you can make any blended beverage your heart desires, anywhere you are. While it does take some practice, this blender comes with a dual speed gear system to make each turn count double. Coupled with an elongated lever, you should be able to blend your ingredients in no time. Another great feature is the shatterproof 1.5-liter pitcher, which can help you make enough drinks to go around the campfire. Finally, this unit comes with a c-clamp that gives you more stability as you blend. If you want to be sure you're making the right choice for your needs and budget, read the buying guide we've prepared for you below. Here you'll find guidance on the pros & cons of each type of portable beverage maker, ​as well as the features, capabilities and uses. Motor not as strong as regular wired blenders, so blending could be less efficient with some rechargeable models. If you’re looking to do more advanced blending, such as making nut butters and nut milks, portable blenders are not strong enough, and you should go for high performance blenders. When looking at a portable blender, you have to ask yourself how you will be using it. Are you planning on making mixed drinks for you and your friends? Or are you looking for something personal that will make one serving only? Thus, if you’re getting a standalone unit, you have to make sure that it can make enough for several drinks at a time unless you want to be blending non-stop. If you’re not interested in making more than what you want for yourself, then you want something that’s not too big. 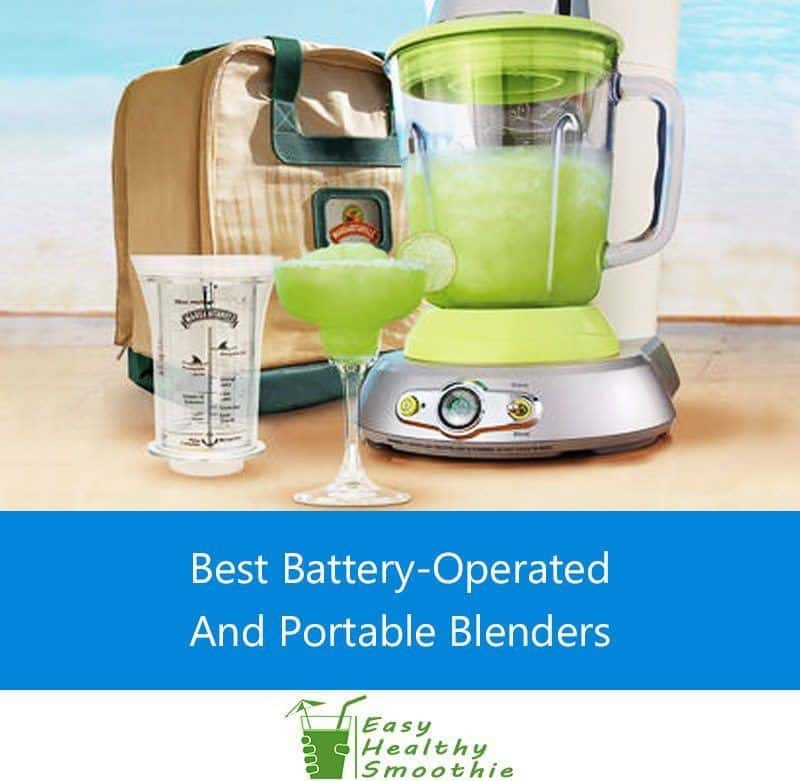 The other significant thing about portable blenders is that they can be of the handheld immersion type, or a stand up unit which might resemble a regular counter top blender. The latter is what you would get if you want to make a big batch of margaritas for your friends. If you’re looking to mix some powdered drinks or something simple, then a handheld model may be better. 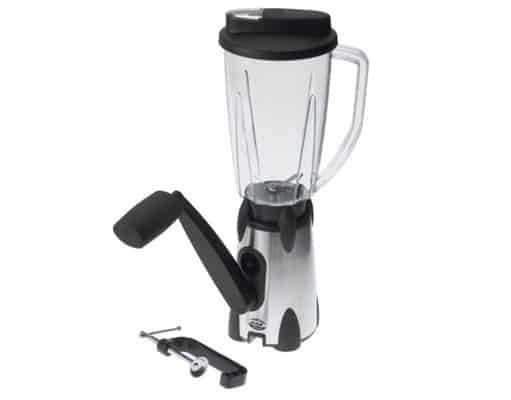 This type of blender has the blade on the end of a stick, hence their popular name - stick blenders. Stick blenders enable you to mix your ingredients in whatever container they are in, which is of course very convenient for outdoor use. Because portability is the most important thing in this situation, you have to pay careful attention to the power supply of the device. Will it need to be connected to a portable power supply such as a car battery, or does it have it's own internal rechargeable battery?​ We've selected here the best models that offer these options. For most stand up units, you still have to plug in somewhere, which is usually an A/C adapter in your car or boat. While that does provide sufficient energy for the blender, it does mean that you have to be careful about draining your battery, so you'd still be able to turn the engine over. Another option, usually with handheld models, is to use a battery to operate the blender. In this case, you are much more portable and less restricted. This is very useful for camping, for example. A great advantage of blenders with a rechargeable battery is that you can use a variety of portable power sources to recharge them. My favorite is using a USB battery pack to recharge my blender. This effectively turns it into a USB-powered blender! With portable units, you do have to worry about battery life more than anything. If the blender runs on alkaline batteries, you could be going through them quickly. Ideally, you will get a rechargeable model, but that does require you to have a stable power source for recharging. If you're looking to make larger batches of smoothies or margaritas without worrying about how long will the power last, there's a totally different solution you can look into - either a gas-powered blender or a manually operated one. For more power, go for the stand up units. 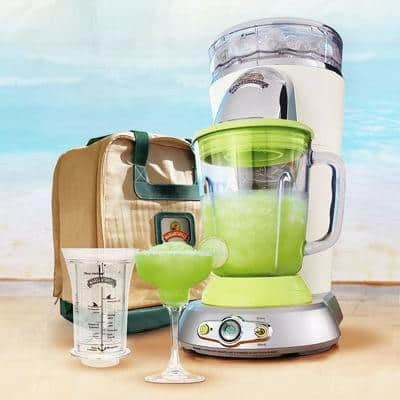 Some models, such as the Margaritaville we reviewed here, provide 450 watts which is enough to blend most ingredients, and even handle ice - though not as effectively as some regular counter top blenders. The Waring model features substantially less power, only 45 watts, but can still handle ice to a certain extent due to its smart blade design. Hand held immersion blenders feature a small motor and are usually much weaker than other types of blenders, therefore they will have a hard time coping with anything other than soft ingredients. If you're looking for more versatility and ease in making outdoor smoothies and other blends, then go for a model that features a selection of speeds. Some portable blenders offer only a single speed, or a "high / low" speed setting, while others such as the Waring TG15 offer multiple speeds. When looking at different portable blenders, you will notice that handheld models usually have different attachments for you to use. When choosing the best models to review, we've also taken care to select models from different price categories. 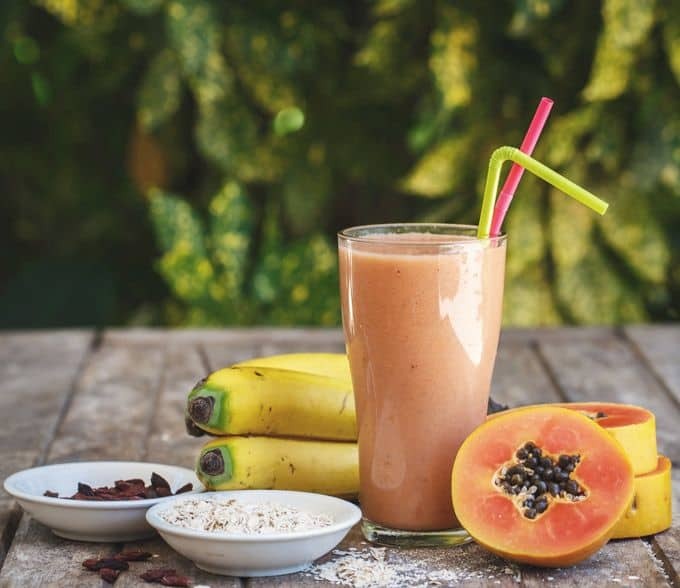 Using a cordless or battery operated smoothie maker is not much different than any other type of blender, though there are a few special consideration we’ll discuss here. Smoothie recipes are simple and usually contain just a few ingredients. We have a vast library of smoothie recipes so just choose one to your taste from here. With portable blenders, which are usually less powerful than regular ones, it is best to cut the vegetables and fruit into smaller chunks. Otherwise the blender might have a hard time chopping them effectively. To enjoy the maximum amount of nutrients, consume the smoothie as quickly as possible and don’t let it stand for more than a few minutes. As with regular blenders, it is best to wash the jar immediately after making and drinking the smoothies. Otherwise the concoction sticks to the jar walls and is much harder to remove later. Even if you can’t properly wash the jar with soap, just do a quick wash with water to get rid of all the leftovers. For the ultimate guide on how to make delicious and healthy smoothies, check out our guide here. To help you make your decision quickly and effectively, we’ve created this table so you can compare how each of the blenders we are about to see stack up to each other. This way, you should be able to pick one out without having to scour each and every review. When comparing these blenders to each other, it’s hard to pinpoint one that is better than the rest. If you want a standalone unit, then we’d highly recommend the Waring TG15 Tailgater, as it has the best results with the least amount of power consumption. If handheld is more your preference, then by far the Cuisinart CSB-300 is the way to go, as it has the most features and attachments, making it more versatile and reliable than anything else. Finally, we do like the fact that the GSI Outdoor Blender doesn’t require a power source, but it will take some time to get used to cranking the machine and getting an even blend every time. What are your own experiences with blending drinks and smoothies outdoors? Tell us in the comments below. If you're new to blending, also check out our guide to choosing the﻿﻿﻿ best blender for smoothies. Be sure to share this post with your friends so they too can discover the best ways of making drinks when away from home! Want to make drinks at a beach party, tailgating or camping? Here’s the top blenders that you can take almost anywhere to make instant party drinks or healthy smoothies.